Today I Am Carey is a story set in the near future. 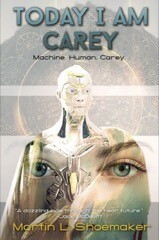 It concerns an android named Carey that is designed to assist terminally-ill patients who are suffering with dementia. It is able to comfort these patients because it contains two different neural networks that can work together: one that can empathize with the patient, and another that can emulate (as in physically become) friends and family, whether living or dead. In the first chapters of the story, Carey becomes whoever Mildred, who is in the late stages of Alzheimer’s, asks for, whether it be her son, daughter-in-law, grandchildren, or even her departed husband. Normally a medical care android’s memory will be wiped after their patient dies, but Mildred’s family asks for Carey to stay on with them, a request that is granted because something is unique with it, and Carey’s designer wants to try to understand why. The story takes off from there. If you’ve read any of Isaac Asimov’s robot short stories, particularly Bicentennial Man (and the Robin Williams movie based off of it), you may recognize a similar theme at the beginning of Today I Am Carey: a robot/android that seems to be becoming almost human and the ethical and legal implications of that. But Today I Am Carey takes the story in a different direction, and in my opinion takes Asimov’s ideas into an entirely new realm of storytelling. 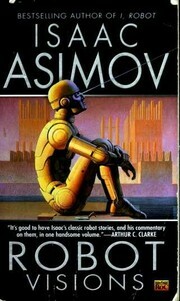 In Asimov’s robot stories, his Three Laws of Robotics prominently figure in just about every story. In the case of Bicentennial Man, the main issue is at what point a robot becomes physically human enough so that the Three Laws do not apply. In Today I Am Carey, there are some plot points that deal with Carey’s legal status, but the main thread of the story is more about its mental and emotional development towards becoming more human and how that affects the human characters in Carey’s life. Although there are many ideas about artificial intelligence that Shoemaker explores throughout the book, Today I Am Carey also delves deeply into the human characters surrounding the protagonist. After all, what better narrator to use in a character-driven story than an android that has an empathy neural network? Carey, because of his unique construction, can infer things from its interactions that a human being would never be able to infer. I think that first-person narrative elevates the story from your standard exploration of ideas to something that every reader, not just those who enjoy science fiction, would enjoy and relate to. Shoemaker’s prose is deceptively straight-forward. I still don’t know how he did it, but he was able to make a story narrated by an artificial intelligence in a matter-of-fact manner deliver powerful emotional impacts, even when you have an inkling that those impacts are coming. The ending ties the events of the story together in a way that was both perfectly appropriate and in a way I never saw coming. Up to this point, I have solely focused attention on what the Indians have been doing, but that leaves unaddressed what the other teams in the AL Central have been doing, particularly the Minnesota Twins, the one team that I think could dethrone the Indians. There’s still an obvious gap between the two teams, but there’s enough potential on the Minnesota roster that you could see the possibilities on them making large improvements if a couple major things go right for them. 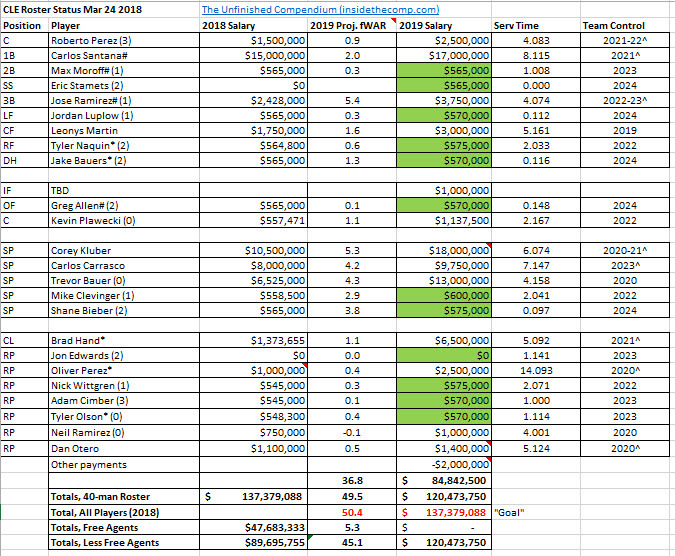 With that in mind, I’ve put together projected Opening Day rosters for the Twins and Indians to compare them. The Indians’ roster looks as it stands this morning, as well as a zoomed-in version of just the 25-man roster. There has been a lot of uncertainty with this roster. The outfield and bullpen have essentially had open tryouts, and injuries to both Francisco Lindor and Jason Kipnis means that neither of them will be in the lineup this Thursday in Minnesota. This comes after a winter that saw the Indians prioritize cutting payroll over improving the roster for reasons gone into previously. But even after all of this, the Indians still seem by a significant margin the best team in the AL Central. The projections I used (Steamer for position players, ZiPS for pitchers) are 49.5 wins above replacement, which is just one win shy of their actual totals from last year. Here is what the Twins are projected to do using the same ZiPS/Steamer combination. Some of the minor roles have changed since I did this exercise, but not enough to change the totals significantly. Even after all the subtracting this past offseason, and even with question marks all over the roster, the Indians still project to win 10 more games than the Twins, their closest competition. If the starting rotation stays healthy, and the Indians can cobble together a functional (as in above replacement) bullpen and corner outfield, they’re still in good shape to win the AL Central again. Which is one reason why I think the Indians prioritized the medium-term over the short-term this offseason. The gap between themselves and the rest of the AL Central wasn’t the only factor, as I don’t see this front office ever going completely for broke (too many institutional memories of 2002-03) or thinking for a short while like a large-market organization, but it did make those difficult decisions easier. The caveats that need to be made: projections are not foolproof, as they are forecasting human beings that can get hurt or better or worse in ways completely independent of their age or previous results. I can easily imagine situations in which the Indians and Twins win totals are reversed. Breakout seasons for Kyle Gibson and Jose Berrios could quickly halve that 10-win gap, for instance. With that being said, it’s time to enjoy some baseball. Happy New Year! Now that Manny Machado ($300M/10) and Bryce Harper ($330M/13) have signed, it’s time to go into a bit more detail about what’s seemed to be the running theme this winter among baseball writers: the inevitable conflict between the players and owners. A lot of the rhetoric has been hyperbolic, especially given the amount of money spent on Machado and Harper (as well as Nolan Arrenado ($260M/8), who signed a contract extension recently), but there is a grain of truth buried among all of that. First, I want to share my premises and, more importantly, where my interests lie. I do this to help you, the reader, understand where these opinions come from, although I will never disregard a truth even should it be against an interest. I am not an ideologue when it comes to baseball issues, never mind a moralist, but tend to prioritize the interests of a mid-market fan above those of anyone else, because that’s my relationship in this industry. I have always been, and always will see myself as, a fan of the Cleveland Indians. When I earned a check writing about baseball, my interests were aligned with those who visited the site, as they were invariably also fans of Indians. I specify that I am a fan of a mid-market team because the current financial rules that MLB teams and players abide by make it easier for big-market teams to succeed. Because a larger market means a larger local TV contract, and because local TV money has become a larger percentage of total revenue, big market teams have the means to sustain a larger payroll than teams in smaller markets. (Yes, there are exceptions to the rule – with big-market owners who spend very little and small-market owners who spend like the big boys, but those are exceptions.) The Cleveland Indians’ market size is roughly in the middle of the 30 MLB teams, and as such ranks similarly when it comes to TV revenue. So as a fan of the Indians, I am concerned about competitive balance, particularly among payrolls, because it affects how competitive the Indians will be. Now a large payroll is not a guarantee of success, but it makes things easier. For instance, the 2018 World Champion Red Sox lifted the trophy despite having paid a combined $52.52M in that season to three players (Hanley Ramirez, Rusney Castillo, and Pablo Sandoval) who they had already released. A team from a smaller market would have struggled for years trying to deal with that amount of dead money on a payroll, never mind being able to sign additional free agents to similar deals. In other aspects, though, I share the same interests with all fans. We want our teams to win, or at least be regularly competitive. We want to be entertained by the game on the field and by our experience at the ballpark, and have access to that game (whether it be in the form of tickets/concessions or TV/video) be affordable and readily available. There are two other main interests in the sport: the owners, and the players. These three interests (owners, players, fans) will align in some areas, sometimes two will align, and sometimes all three’s interests will diverge. And even individual interests will not be aligned on a subject. For instance, the owners of the Kansas City Royals and New York Yankees are going to completely disagree on where the luxury tax threshold should be placed, and any of the other rules related to it. A journeyman player who has no hopes of ever getting a multi-year deal is going to be at odds with a superstar over what the minimum salary should be. And a fan of the Pittsburgh Pirates is going to be at odds with a Los Angeles Dodgers fan over when a player can become a free agent. The reason I bring all this up is to counter the standard “players vs. owners” narrative that you see practically everywhere. First of all, to treat this conflict as one between two imbalanced and monolithic entities (with the owners having a power advantage) may be great for clicks or views, but it does not reflect reality. The two sides are, in my estimation, equally powerful, as MLB has one of the most player-friendly CBAs in North America professional sports thanks to well-fought gains over the last four decades. Secondly, there are factions within these broad interests that are just as conflicted with each other as they may be with the other interests. And thirdly, this narrative completely disregards the third interest, that is, of the fan, who may be aligned with one of the other interests, but in total has his or her own unique goals. The fan may not be represented at the negotiating table, but even so has a veto in the form of a closed wallet. If whatever is decided makes the sport (in the fan’s eyes) less competitive, less entertaining, or more expensive, the fan will simply spend less time or money on baseball. That is something neither of the other two interests want, and so they ignore the fan at their peril. It is important to emphasize that I do not bear the players any ill-will, nor the owners for that matter. I am pro-fan, not anti-owner or anti-player. The proximate cause, in my estimation, of the current trend in free agent spending, is a change in how teams value players, particularly older ones. New ways to analyze players, first proposed by writers decades ago, have been largely accepted by most teams, who now have positions or even complete departments dedicated to this type of player valuation. Sites like Baseball Prospectus and Fangraphs have long served as farm teams for positions in MLB front offices. So is there any wonder that teams are now acting on these ideas when it comes to making signing decisions? Particularly when it comes to the age of the free agent in question? This is why I think players that are past their theoretical prime (27-29) have seen fewer lucrative free agent deals over the past several years, and the few players who can become free agents before or during their theoretical prime continue to be handsomely compensated. Manny Machado and Bryce Harper broke into the majors as teenagers, and so were able to become free agents in their mid-20s, with their best years seemingly ahead of them. Both received contracts worth at least $300M. Nolan Arenado was one year away from free agency as a 27-year-old, and received an 8-year contract (buying out 7 years of free agency) in which he will receive an average of $32.5M a year. But these players are the lucky few who were in a position to demand this kind of compensation. The remainder, who either broke into the majors at a more advanced age or who didn’t have quite the kinds of careers those three had, are seeing their contract offers get less lucrative. Those good but older players no longer get lengthy contracts that keep them locked up into their late 30s. Instead of relying on good but declining players, teams of all payroll sizes are looking to their farm systems to supply the bulk of their talent. It used to be that teams valued known quantities over payroll cost, but now these priorities have shifted to the point where teams are more likely to go with an inexperienced player than a more experienced one. This trend has resulted in the hollowing out of baseball’s upper middle class. The young superstars are still getting paid at the same rates in free agency, and young up-and-coming players are also getting long-term contracts, but with few exceptions the older players are not getting similar treatment. For many years players accepted that they would be drastically underpaid during their first 4 seasons of major-league play, but it would be made up for by the last few years of arbitration and once they reach free agency. Arbitration is still working as intended, but not free agency for most players. That is why something has to give, as the system is not working for more and more players. What would addressing this imbalance mean for someone who roots for a mid-market team? Lowering the service time needed to become a free agent would probably be the worst outcome, as it would mean smaller windows of opportunity to all but the best-run of organizations. Changing the luxury tax threshold or lowering the penalties for exceeding it would also be a bad thing, as would increasing the minimum salary. Now these things could be compensated for with increased revenue sharing or other ways to increase competitive balance, so it’s important to look at an entire agreement, not just one individual clause. I think a radical shift in the baseball economic landscape could actually benefit teams from the smaller markets as well as the underpaid players, but that would involve things like centralizing all TV revenue and distributing it equally or instituting a hard salary cap/floor. But I think the other two interests (as long as they are largely controlled by the superstars/agents and large-market teams) are too much entrenched for a sea-change like that to happen absent some catastrophic work stoppage. I was planning on waiting until either Machado or Harper signed (preferably both) to finish up this series of posts, but as Spring Training has begun and the Tribe roster is more or less set, I can’t wait any longer. So the speculation about the state of free agency in general is going to be pushed off until another time. With the Trevor Bauer’s arbitration hearing going in his favor ($13M, the Indians offered $11M), my estimate for Opening Day payroll is about $119M if you include the equivalent of 5 minor-leaguers to cover DL* stints over the course of the season. That would fall about $20M short of their ending 2018 payroll. Spending is not a perfect predictor of how good a team will be, given how the current salary system is set up, with good younger players being less compensated than good older players. With that said, I think they go into Spring Training a less talented team than the one from Game 3 of last year’s ALDS, particularly on offense, with projections showing the team 5 wins (fWAR) short of last year’s roster. Gone is Michael Brantley, who signed a 2 year, $32M deal with the team that eliminated the Indians last year, and in his spot will be either Jordan Luplow or perhaps Jake Bauers. Gone is Lonnie Chisenhall, and his spot will probably be filled by Tyler Naquin. Gone is Edwin Encarnacion, and his spot is up in the air right now; it could be filled by Bauers, Carlos Santana, or shared among many players. Teams like the Indians need to take chances on young players to remain competitive over the long haul. However, as things stand, the Indians are going to be giving everyday spots in their starting lineup to at least 3 players who have yet to have a full productive season in the majors. And that doesn’t count the catching position, which will likely be shared by Roberto Perez and newly-acquired Kevin Plawecki, replacing Yan Gomes. Francisco Lindor’s calf injury makes the early-season lineup look even more suspect. I have less of a problem with the way the Indians addressed the bullpen. Gone are Cody Allen and Andrew Miller, and in their places are several handfuls of relievers who have some potential but also can be sent to the minors. Because the Indians kept the rotation intact, they could use Danny Salazar (if the stars align) and Cody Anderson as relievers. Bullpens are fickle beasts, and I don’t mind opting for quantity over non-guaranteed quality here. They did bring back Oliver Perez, which should help stabilize the back end of the bullpen, but they desperately need a right-handed reliever to step into a key setup role. There are two schools of thought about how a team like the Indians should operate. One is that you must maximize a short window of time for competitiveness by spending generously in terms of money and prospects, then completely rebuild. The other is that it is possible to keep the window open for a longer period of time by being good enough to compete for the playoffs but not be guaranteed of a long run into it. The Indians are attempting the latter way, perhaps mindful of how the 2005-2007 run collapsed so quickly. The minor-league organization has gotten praise for the number of prospects in the lower minors, so there is a chance that the team can remain competitive even after the current set of stalwarts inevitable leave or get too expensive. But by playing the long game, the team risks turning off fans who want to see them push all their chips into the middle every year, or at least some of them. And they have a point as well, because if Luplow, Naquin, and Bauers don’t take that next step, the offense could drag down a great rotation. The AL Central once again appears very weak, particularly where the Indians are strong (starting pitching), but you can’t keep assuming your competition will continue to be inept. And strengths can quickly become weaknesses; one or two key injuries could quickly push the Indians backwards into the rest of the division. I’ll take a look at that competition next time. *Yes I know MLB has changed the term to Injured List, but habits are hard to break and I just can’t make much of an effort to do so. I last wrote about the offseason on December 28, describing the impasse the Indians were in because they were waiting on larger events to happen first, particularly the signings of Manny Machado and Bryce Harper. Both players were (and still are) expected to get massive contracts both in terms of length and monetary value, and when those signings happened, that would induce the teams who were in contention for those two to fix their gazes on their next-best options. As it turned out, nothing has changed since December 28. There have been some free agent signings, and the Indians have even acquired another catcher (which I will look at presently), but the logjam is still there. Although MLB does not have a hard salary cap, each team does have a internal spending budget that they’d like to stick to, so if they still want to have any chance of landing Machado or Harper, they can’t commit to anything that would push them over their limit (whether that be a signing or a trade) if they also signed one of those two. And so plenty of other free agents, who would like to sign with a team as soon as they can, are stuck in limbo. It also should be mentioned that more is riding on what Machado and Harper eventually gets. Many baseball opinion/analysis sites are in full “players vs. owners” mode as the trend of second tier free agents getting less lucrative deals has become more obvious. For example: in 2013, free agent Nick Swisher signed a four-year, $56M at the age of 32, after a accumulating a career bWAR of 20.9. Earlier this winter, at the age of 32, Michael Brantley, who has accumulated 22.7 bWAR, signed a two-year, $32M contract. I think the current paradigm of players sacrificing salary early in their careers (and this includes minor-league salaries) for a chance of hitting it big in free agency is not sustainable, given that fewer and fewer players are actually getting that big mega-deal. So if more and more of the percentage of team free agent spending is directed towards the elite free agents, then more pressure is going to come from both interests on the parties involved, and that could be one of the reasons why the Harper/Machado signings have been delayed for so long. This trend in recent years of big moves happening later and later into the offseason makes following the hot stove season rather annoying. Unlike other sports (like the NBA), in which the vast majority of signings are condensed into the span of a couple weeks, major free agent signings can happen well after pitchers and catchers report for Spring Training. I would not be opposed a smaller “free agent window” being agreed to in the next CBA that stipulates the latest date a free agent can sign and be eligible to play in the upcoming season. At the very least the goal should be to get the highest-price free agents signed first, and after that everything would happen in due course. For example, if the ending of the “elite signing period” coincided with the General Manager’s Meetings, that would be a great spectacle for anyone interested in the offseason events, a winter version of the July 31 trade deadline. Then after that, teams would immediately move on to the other free agents and trade targets, leading a flurry of active at the end of the year and a couple weeks into January, so that by this time of the year, the vast majority of rosters will have been set and the season prognostications can begin. This move gives the Indians either a second full-time catcher or a competent backup, depending on how the position shakes out this spring. I would expect Roberto Perez to have a leg up heading into Spring Training given his advantage of knowing the pitching staff, as well as his defensive prowess. Plawecki has struggled to throw out runners throughout his major-league career, hovering between 19-26%, but has been a better hitter than Perez over the last couple of seasons. The Indians give up a player they acquired from the Padres a couple months ago (Lockett) and a marginal minor-league prospect (Haggerty), so all in all, this deal partially fills the hole left by Yan Gomes. If Terry Francona uses both players like I think he can, I could the catching position being just as good as it would have been had Gomes not been traded, for about $5.9M less (the difference between Gomes’ and Plawecki’s 2019 salaries). The most important piece of information to know about this waiver claim is that Cole is out of options, and so has to make the 25-man roster to stay in the organization. Even if the Indians end up trading Corey Kluber or Trevor Bauer, the only way Cole makes the team is via the bullpen, which has plenty of spots up for grabs at this moment. That’s it. The catching position is taken care of, but no real upgrades for the bullpen, and nothing for the outfield. I’m still hopeful that these needs will be addressed one way or another, but I can’t tell you when that be. Until then, we wait. And wait. And wait. Or in truth, an expansion of my previous review of the book. 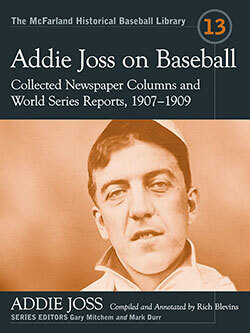 I originally reviewed this collection of Addie Joss’s newspaper writings at Let’s Go Tribe in 2013, and all of my comments back then still hold true, but I want to dive in a bit deeper now that I have the leisure to spend more time on it. Addie Joss has been a fascinating player to me in part because there is so little information about him. He died suddenly in 1911 at age 31, while professional baseball was still growing into the national pastime it later became. Lawrence Ritter’s The Glory of Their Times, a ground-breaking collection of reminiscences by former players that sparked a rush to record the history of early baseball, was first published in 1966. By that time practically all of Joss’s immediate family were no longer alive. He was inducted into the Hall of Fame in 1978, but by that time, as Blevins writes in his preface, it was “almost like an afterthought.” His contributions had been recognized despite his brief career, but almost nothing of his personality could be passed down. Joss was hired in 1906, without any previous writing experience, to be the Sunday edition sports editor of the Toledo News-Bee. 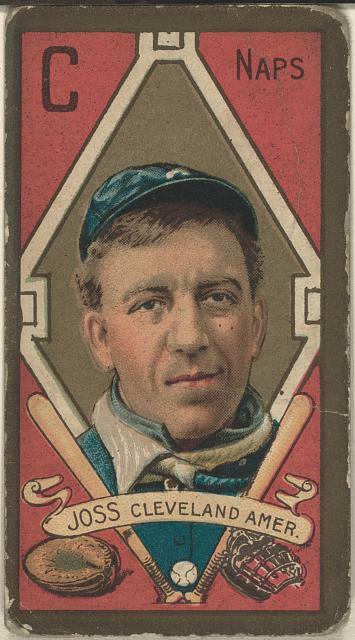 Joss had moved to Toledo in 1900 when he signed with the Mud Hens, and still made the Northwest Ohio city his offseason home. The hiring was designed to help win readers over from the established Toledo Blade, and it paid off in spades. Joss not only wrote articles about baseball, but edited and wrote articles about other sports. That he was able to quickly learn a business he had no prior knowledge about was quite a feat, and that would lead to him writing a weekly column as well as covering covering three World Series (1907-1909) for the Cleveland Press. By the end of his brief writing career, he was known nationwide as not only a great pitcher, but also as a baseball columnist. The collected columns are arranged thematically, not chronologically. There is a chapter about Joss’s personal friendships in baseball, one entirely about humorous incidents on and off the baseball diamond, and one on great feats and plays. There are sections devoted to dealing with fans, “inside baseball” (or would be called strategy today), the way baseball was played in the decades before his time, and his game reports from the 1907-1909 World Series. The collection ends with some columns about larger issues within the sport. Some of that generosity is only learned once you learn the context, which is why Blevins’ annotations are so valuable. He wrote two columns about his friend Win Mercer, who committed suicide while on the 1902-03 barnstorming tour of the West: the first of which talks about Mercer’s career as a star pitcher and “matinee idol,” and the second of which is about the events that took place just before his death. There were allegations that Mercer attempted to steal the barnstormer’s pot to pay back gambling debts, but Joss, who was on the tour, recounts a more generous version of those events, in which the note to the hotel clerk to send the money was not written by Mercer but was a forgery. Numberless instances could be related by all players who have been playing the game for any length of time, but they would only tend to strengthen the opinion that luck is an essential factor in a team's pennant aspirations (1-27-1907). One thing that has changed considerably since the first decade of the 20th century are the baseball terms used, and that did take some getting used to. Joss uses “twirler” often in place of “pitcher” and “sphere” as often as he uses “ball,” and though at first those terms seemed rather bizarre and forced, after a while they started to become familiar, and I could begin to understand why they were so popular. Heck, I’ll probably start referring to pitchers as twirlers here and there just to liven things up. .....Just as the big fellow was winding up to pitch the next one, a fog horn voice shouted: "Get out of there you big stiff, you're all in! You've lost your arm." You can well guess how Rube responded to this heckle, which played right into Mack’s hands. Joss stopped writing for the News-Bee in early 1909, instead choosing to spend his winters running a pool hall and singing in a vaudeville quartet. He still would pop by his old workplace from time to time, and that he was still beloved by his former co-workers is evident by the way the paper covered his death. "He was studious and ambitious and serious, but when I say serious I do not mean sober, for had that rare and divine gift, a sense of humor. He was always cheerful. He seemed always to have some good news for you. He never whimpered or complained; he could smile even over the injury to his right arm last season - the arm that meant so much to him." 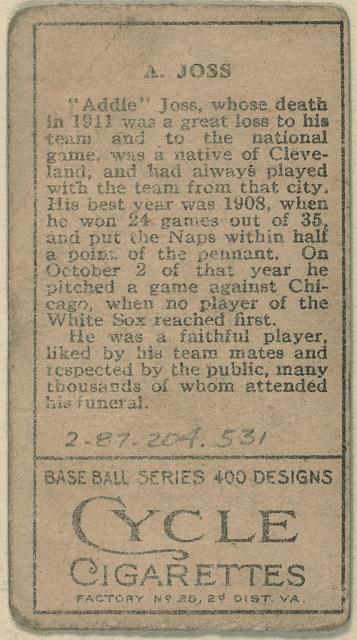 His teammates threatened a strike if their game in Detroit was not postponed so that they could attend his funeral in Toledo. And there was the proto-All Star game held in Cleveland later that year to raise money for his widow, which is a fascinating topic in and of itself. I like to think Addie's baseball writing as our own direct line to one of Cooperstown's most disappeared inductees. The extant articles are Addie's first-person observations of the game and its players, many of them baseball immortals and most of them his good friends, from the first decade of the American League. Although the Indians have made several major moves, the only player they acquired that would be a good fit in a corner outfield slot is Jordan Luplow, who they received from the Pirates in the Erik Gonzalez deal. And if that happens, Luplow would be a major downgrade from Michael Brantley*, who signed last week with the Houston Astros. Jake Bauers theoretically could end up playing some outfield, but after trading both Edwin Encarnacion and Yonder Alonso, he projects to share 1B/DH with Carlos Santana. And that’s not even addressing the projection of Tyler Naquin as the team’s starting right fielder. As things stand now, the Indians would be getting a total of 1.0 win above replacement combined from their corner outfielders, which would certainly place them among the worst in baseball at those two spots. In other words, something has to happen. Compounding the uncertainty on the current roster is all the rumors about Corey Kluber. Depending on which baseball reporter you follow on Twitter, Kluber is going to the Dodgers, the Reds, or even the Padres, and that’s not counting the teams that were reported to “have interest.” And there’s also the underlying questions about what the team’s payroll will end up being by the time the team takes the field in frigid Minneapolis in late March. My assumptions have been all along that the 2018 ending payroll would be a good approximation for the 2019 beginning payroll. For many reasons, the Indians front office isn’t going to give out specifics about what the actual budget is, foremost among them is to deny clarity to the team’s rivals. But for a casual fan’s perspective, that kind of uncertainty is going to make him hesitate before pulling the trigger on a ticket package, especially with the Kluber rumors swirling about. In other professional sports (like the NBA), all the major moves could happen within the span of a week. But in baseball, those moves can be spaced out over three, even four months. The two biggest free agents of the winter, Bryce Harper and Manny Machado, still haven’t decided where they will sign, and because of that, many other teams and free agents are stuck in limbo. Once the two marquee free agents sign, the teams that lose out will immediately put their Plan Bs and Cs into action, which could include other free agents or trade targets. That’s why I think the Indians haven’t made their final set of moves, as the Dodgers are one of the front runners to sign Bryce Harper. There’s probably a trade package for Kluber they’d be willing to offer if Harper signs, and a different package if Harper signs elsewhere. And until the Dodgers make their final offer, the Indians can’t finalize a deal, if there is a deal to finalize. And given that it’s extremely likely that a starting corner outfielder is going to come from any Kluber deal, they haven’t acquired in a separate deal. And you can keep the transaction dominoes falling until your head hurts. 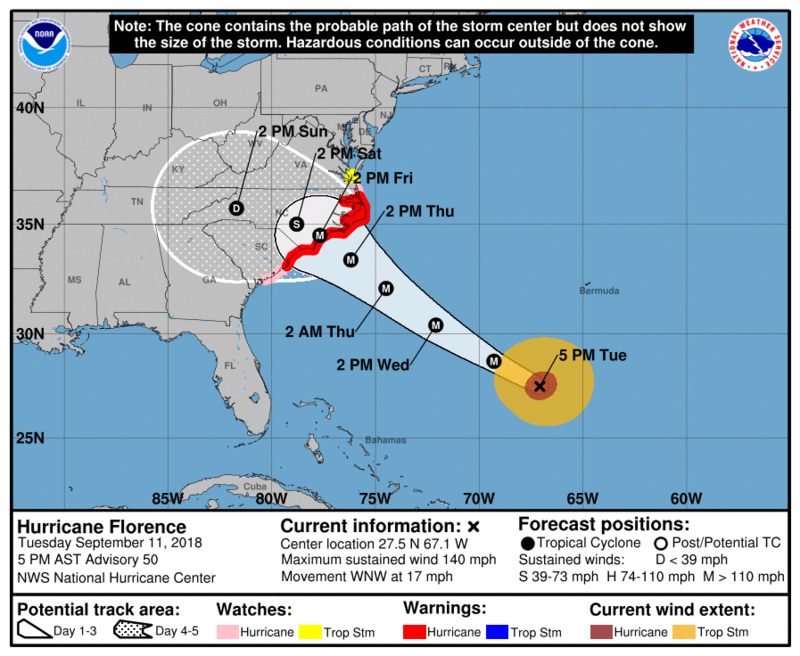 The cone represented all the potential paths that the center of the storm could take over the following days, with it getting ever wider with time. The MLB offseason has its (much less serious) cone of uncertainty while its biggest signings have yet to be made, and the Indians, because of what they need to accomplish, are more subject to it this year than in the recent past. *Given what Brantley signed for (2/$32M), I think the Indians whiffed here. Had they re-signed Brantley at that amount, they still would have had room to sign a couple relief pitchers, and probably kept Kluber as well. Of course, that assumes that both Brantley and the Indians wanted to strike a deal, but from the outside it looks like a gigantic missed opportunity. I’ve separated the 3-way trade between the Indians, Mariners and Rays into two separate deals because in essence that’s what they are. The only thing changing hands between the Mariners and Rays is $5M, apparently to bridge the gap between their valuations of Bauers and Diaz. 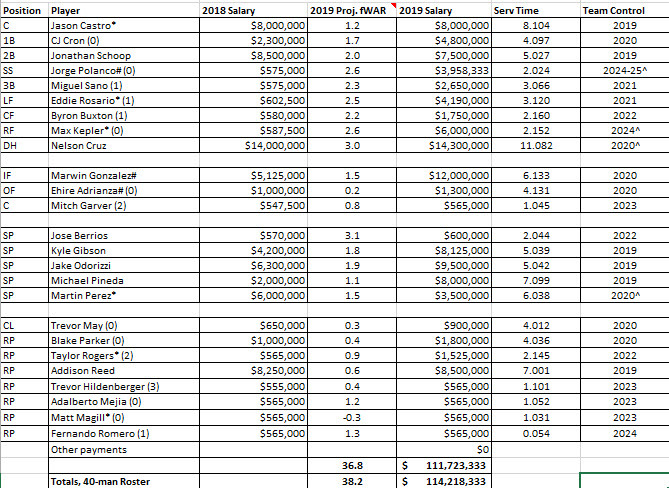 Trade 1a is a trade of large salaries, with the Mariners taking on more this year in exchange for almost nothing to pay out next year (save the $4M to Cleveland), while the Indians commit to $14M for Santana next year in order to take $9.5M off their payroll this year. In addition, Santana can play first base everyday, freeing up the DH spot for some other player or players as the offseason progresses. And of course there’s the side benefit of bringing back a player that liked being in Cleveland, and who was liked by his teammates. Steamer projects that the Indians will have the better 1B/DH next year, and moving back to the American League won’t hurt Santana’s production either. Trade 1b has a less obvious justification. In trading Yandy Diaz, the Indians seem to be dealing a player on the cusp of breaking into a full-time role, a player that has a unique set of skills in today’s game: a ground-ball stroke combined with an incredible bat speed. Even if Yandy never hits for home run power could easily make a career for himself as a top-of-the-order hitter. His profile fits better in the 1910s than in 2010s, but even today I think he can make a career for himself. He’s going into his Age 28 season, but I think that makes him quite a bit for valuable to the Rays given that if he does break out, he’ll be under team control throughout his prime years. Bauers is 5 years younger than Diaz, but is likewise on the cusp of playing every day in the majors. Given the Indians’ desperate need in the outfield, Bauers could play in left and right field, but ultimately I think he’s the first baseman of the future. As for the Alonso deal, it’s almost a carbon copy of the Yan Gomes trade. The goal was to have someone take on Alonso’s 2019 salary (and perhaps even his 2020 salary if his option vests), and with the White Sox are very interested in landing Manny Machado, the opportunity to acquire his brother-in-law was apparently appealing even with the price tag. The prospect the Indians received in return will not help the team this year, or probably next year. But again, the major return in the deal is the $9M that the Indians won’t be paying Alonso. Here’s a couple key quotes from Chris Antonetti about the trades this week. Given that the market value of 1.0 WAR (wins above replacement) is between $8-9M, the Indians did well here if you look strictly at payroll and projected production. They did lose 1.4 wins as a result of the two trades, but dropped $18.5M in the process. They could easily buy those 1.4 wins back on the free agent and still have some of the savings left over. There’s still several major holes to fill (Luplow and Naquin as the starting outfielders should give everyone pause), but the Indians now have a decent amount of payroll room to add some significant help. If you assume that last year’s ending payroll is the limit for next year as well, the team now has about $23M to work with, and that’s without having to trade one of their top starting pitchers. I think now you’ll start to hear rumors based on free agent targets and not just trade talk. As noted by Chris Antonetti, this deal does not affect the 2019 or 2020 payroll, other than by making the 2020 salary guaranteed (before the extension, that year was a team option). What it does do is to make some of the trade options the team was contemplating more palatable. To be specific, if the Indians had traded Corey Kluber before the Carrasco extension, their 2021 rotation looked rather pedestrian, as both Carrasco and Trevor Bauer would have been free agents following the 2020 season. Now, with Carrasco locked up through at least 2022, that means they can keep everyone in the past year’s rotation except for Bauer through 2021. Given that the Indians boast one of the top 2-3 rotations in baseball, with starting pitching fetching such a premium on the free agent market, that’s a very big deal for a mid-market team. And speaking of the free agent market, the AAVs (Average Annual Value) of the Carrasco extension ($11.6M if you include the option year), is less than half of what Patrick Corbin just got from the Washington Nationals(6/$140M, $23.3M AAV). And lest you think that Corbin is a better pitcher than Carrasco, a quick gander at both historical statistics as well as 2019 projections will quickly disabuse you of that notion. The only thing Corbin has on Carrasco is age (29 vs. 32), but even that comes with a caveat, as Carrasco has only thrown 149 more innings than Corbin over the course of their careers, which is essentially three-quarters of a normal season for a starter. So if you subscribe to the notion that it’s the miles, not the years that determines the life left in an arm, Carrasco is only a year older than Corbin. Carrasco, who signed his original extension after a health scare that involved non-invasive heart surgery in 2014, is the longest-tenured member of the Indians. This contract paves the way for the Indians to trade either Corey Kluber or Trevor Bauer this week at the Winter Meetings. Because one of the objectives of this type of trade will be to clear payroll for free agent signings, I think they’ll want to pull the trigger sooner rather than later, and with several of the top free agent starters (Corbin, Eovaldi) already signing, the clubs that lost out on those free agents may be starting to view a trade more favorably now that the free agent market isn’t as enticing any more. The Indians would use any payroll savings on presumably outfield help, and with Michael Brantley still available and willing to playing some first base, I think there’s a decent possibility that team would be able to re-sign him if the right type of trade happens. Bauer has the highest upside for 2019 of anyone in the rotation, but he’s also the only pitcher in that rotation who isn’t cost-controlled for 2019, as he and the team are in the arbitration process right now. And barring something completely unexpected, he and team will be in the same position next year, with the potential him making close to $20M in his final year of arbitration. Given that the value of starting pitchers is going up compared to many other positions, I think it’s understandable that the Indians would prefer to trade Bauer over Kluber just on that factor alone. And now that Carrasco is locked up, Bauer is the closest starter to free agency. Should the Indians include Jason Kipnis along with Bauer in a trade, that aren’t going to get nearly the type of return in terms of a talent that they’d get would they trade Bauer alone. But that would give them much more payroll flexibility to make deals for free agents or even other trades, assuming of course that the 2019 payroll will be at the same level as it was in 2018. This type of trade, not to mention the type of team involved, in which the team includes a valuable player in order to dump the salary of a less productive player (Kipnis is still a player you’d take in your lineup, but if he’s playing left field, is he really going to be that valuable?) carries with it the risk of alienating the fanbase, both from those who views spending and those who view accumulated talent as measures of a team’s willingness to compete. The failure to follow up a Bauer/Kipnis trade with a meaningful acquisition, be it in free agent or in a trade for an established star, would in my mind negate whatever strategic payroll gains the team makes from the original trade. But if, for example, the Indians announce the re-signing of Michael Brantley soon afterwards, then pull off a deal for 3-win RF later that week, then later on sign a couple relievers, I think most fans would appreciate the entirety of the offseason over what in isolation would seem to be another step back (in addition to the Yan Gomes trade). The Indians will have a very fine and crooked line to walk this week, but the Carrasco extension widens that path, perhaps even straightens it as well. Here’s hoping for big, and more importantly, good news to follow soon. The Indians traded Yan Gomes to the Washington Nationals for RHP Jefry Rodriguez, OF Daniel Johnson, and a PTBNL (by April 15, 2019). Yan Gomes will be entering his Age 31 season, and is set to make just over $7M in 2019. There are two team options in 2020 and 2021 worth $9M and $11M respectively. He’s coming off his best season (by far) since 2014, and is projected by Steamer to be worth 1.2 fWAR, though that is based a partial season (281 PA). If you project Gomes to have what for a catcher would be a full season (450 PA), that gets bumped up to 1.9 fWAR. Jefry Rodriguez made his MLB debut in 2018, starting in 8 of his 14 appearances. He has a mid-to-upper 90s fastball along with a curve and changeup, but has struggled with mechanics, and because of that has trouble staying in the strike zone. He profiles as a reliever. He has two option years remaining. The Indians did not include any cash in the deal. I think it very unlikely that Johnson will help the Indians this year, and Rodriguez if anything would serve as a taxi squad reliever along with many of the other newcomers added over the past 6 weeks. Johnson is by a considerable measure has the highest upside of the two, but as you can guess from the mini-scouting reports, I don’t have much confidence that either is going to stick in the majors. There is the PTBNL, but it’s kind of pointless to speculate about that right now. I note a tone of slight disappointment in this quote, and for good reason. The Indians didn’t get a great return for Gomes, whether you want to measure that in 2019 production or future production. Johnson has a high upside, but a huge amount of risk, certainly not the type of prospect you’d expect for a veteran catcher who was probably the best value at his position in either free agency or trade. The Indians do save $7.08M, but they aren’t going to be able to make up the lost production in free agency, not the way production is valued now ($7-8M per win). Perhaps the Indians are not optimistic about Gomes’ future at the plate, as his fine season at the plate was driven largely by power at the expense of contact, as well as 2018 being balanced out by bad to awful campaigns in 2015, 2016, and 2017. Roberto Perez, who now presumably will be the everyday catcher, isn’t that far off in terms of projected value (1.6 fWAR), but he’s coming off a brutal season at the plate. Given all of the above, I don’t think you can come to any conclusion other than the Gomes deal being largely a salary dump. The Indians are trying to navigate a very tricky offseason in which they need to pare payroll in some areas in order to improve in others. The catching position is apparently one of the areas that they feel they can subtract from without it hurting the team that much. Based on this trade, the Indians now have a bit more payroll room to maneuver, having a projected payroll roughly $13M below their 2018 payroll (assuming of course that the 2019 budget remains neutral). That’s not going to be enough to improve the roster via free agency given that they in a perfect world would like to add a corner outfielder as well as at least one 7th/8th inning reliever. For a fan that pays superficial attention to the comings and goings of the team, this trade would seem to portend an unwillingness to contend next season, and I can’t really blame that attitude right now. The team is worse off now (for 2019 contention) than they were a couple days ago. But there are still many key moves yet to be made, so please, hold your lamentations for now. If next year’s Opening Day payroll is considerably lower than this year’s, and if the overall talent level is lower, then you’ll have every right to complain. But I think the moves are just beginning. The projected payroll as of this moment is $124M (down from $137M, the 2018 ending payroll), and the projected fWAR is 44.5, down from last year’s 50.4. Somewhat lost in the Yan Gomes trade news was the announcement that the team had signed Danny Salazar to $4.5M contract, avoiding arbitration. There was a possibility that they’d non-tender Salazar by Friday’s deadline, but they are sticking with the oft-injured but supremely talented pitcher. For now I have him pitching out of the bullpen, but should the Indians trade one of their top starting pitchers, he’d be the obvious choice to move back into the rotation. Speaking of top pitchers, the Indians are in discussions with Carlos Carrasco on a contract extension, according to MLB.com. That seems to indicate to me that Bauer or Kluber would be the one traded, not Carrasco. The only player non-tendered was James Hoyt (who wasn’t even eligible for arbitration), and even that was essentially a quick way to get him off the 40-man roster, as they quickly re-signed him to a minor-league deal, inviting him to spring training.